A rewarding benefit to offer as an employer - or an all-inclusive salary packaging option as an employee. A novated lease is a salary packaging option that lets you pay for a new or used car and its running costs from your pre-tax salary. It’s a three party agreement between an employee, their employer, and Fleetcare. Novated leasing gives employees access to concessional rates of tax not available via traditional car financing models. By salary sacrificing the vehicle purchase price and running costs, employees can reduce their income tax and gain access to GST savings on the vehicle purchase price, fuel, servicing, tyres, and more. Need help navigating novated leasing? Let us find your next car and never deal with a car salesman again. Fleetcare will source the best car and the best possible price, with national fleet discounts on the purchase price and any accessories you'd like. Already sourced your new ride or prefer a used vehicle? No problems! We'll make sure all the paperwork is done and the vehicle delivered on time and at a great price. Fleetcare bundle the vehicle lease and all running costs into a single payment which is deducted from your salary each pay cycle. The single lease payment will smooth your budget so you'll never have to find the money to pay for tyres again! Driving an unregistered vehicle can have serious consequences. 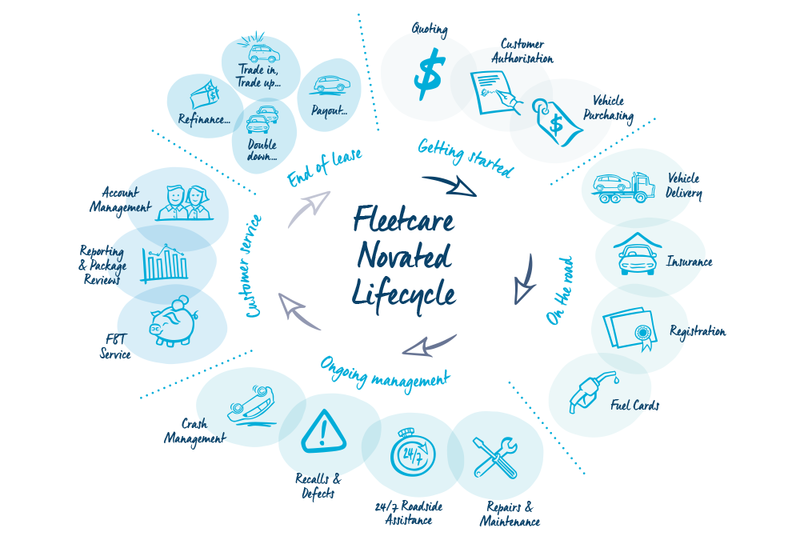 With a Fleetcare Novated Lease, we aim to meet 100% registration compliance, ensuring you're protected at all times. We can assist with vehicle inspections and offer an in-house facility for third party insurance. With fuel cards for BP, Caltex and Shell service stations combined with budgeted fuel spend based on the amount you travel, you'll never be out of pocket. You'll also enjoy half price car washes, available for all Fleetcare customers at BP service stations. You can rely on Fleetcare to get you back on the road faster. Contact us whenever you need help with breakdowns, flat tyre, emergency fuel, key replacement, repairs, a crash or even advice about your vehicle such as tyre pressure. No matter what you need, we can help. With a team of dedicated maintenance controllers working on your behalf, you can rest easy knowing that you'll never pay too much for a service or repairs again. You'll receive automated service reminders, book your service online and then 'drop the keys and go'. Our maintenance controllers will liaise directly with the repairer ensuring optimum service standards, the best rates possible and warranties are claimed at every opportunity. You can choose from thousands of approved repairers including tyres, windscreens and batteries. We include a set of 4 tyres in every novated lease budget, so you'll never be caught out trying to find money for new tyres again. Choose from a range of authorised suppliers, book online and get back on the road faster. Contact our crash management team after an accident. We'll make sure you're safe, then get you where you need to go with replacement car hire. We'll arrange vehicle towing to an authorised service centre and coordinate your vehicle repairs with your insurer. We'll even help lodge your insurance claim including assessment and third-party recovery if required. Our comprehensive insurance product for novated lease holders includes Guaranteed Asset Protection (GAP) as standard ensuring you're never out of pocket in the event of a total loss. We also offer other protection options like extended warranty and Lease Protection Insurance (LPI) which will cover your lease payments if you are unable to work due to illness or redundancy. To help you get to grips with the different benefits of novated leasing, we’ve created a number of online tools that highlight the savings and help you manage your lease. Novated Lease Calculator Get a realistic idea of how much you can save over the course of a year. 6 Steps To Salary Sacrificing Your Next Car We’ll walk through six easy steps to salary sacrifice a new car with a novated lease including how it works and what's included in your lease. Novated Lease Portal Manage your lease, view transaction history, download reports and manage reimbursements. Drive Appy Our driver app offers helpful guides and information on Fleetcare's services, as well as log-book and expense management modules. Think a Novated Lease is right for you?